The Wimp is a personal weather station that uses the weather shield along with an Electric Imp to push live weather data up to Wunderground. You can help increase the accuracy and prediction of weather by adding a weather meter to your house! But why buy an off-the-shelf system when you can build you own? For around $250 you can build a cutting edge open source station that you have complete control over! All you need is a pile of parts and access to a Wifi network. Copy and paste the above code into a browser, and press return. You should see success. 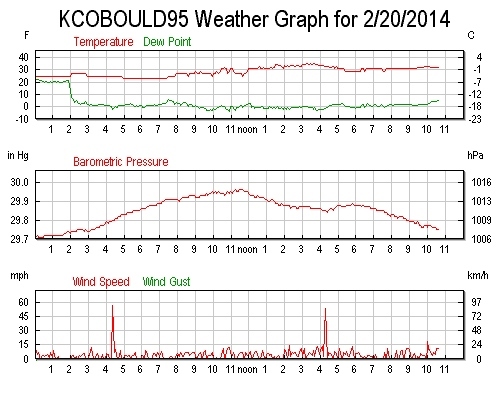 You can then view the weather station data you just posted here. Congrats! You've just published your first weather data to the Internet of Things. 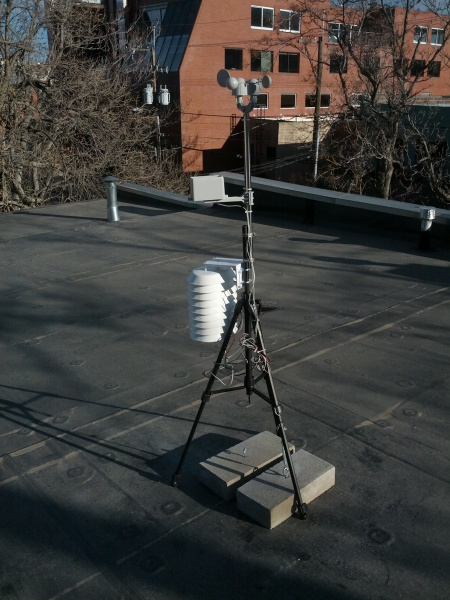 You can also see even more data at the Wimp Weather Stations channel over on data.sparkfun.com. This channel includes some extra bits including battery voltage level, ambient light level, and local time stamp (including DST correction). Heads up! Under real world conditions, the Sunny Buddy may not be able to charge a LiPo battery sufficiently with the 2W solar panel. The Sunny Buddy's output charge current measured was about 7mA since the 2W solar panel was not able to reach the minimum input voltage requirements. We recommend using a larger solar panel like the 3.5W, 6W, or 9W solar panels to achieve the Sunny Buddy's minimum voltage input requirements. Solar Shield - We got ours from Ambient Weather. $40, works great! Camera Tripod - We found a cheap one on Amazon for $20 and chopped the camera mount off. Handful-o-zipties - If you don't have these laying around, you'll need some to secure the various charging and weather meter cables. 2" Hose Clamps - Sometimes called worm clamps, these connect the weather meter to the headless camera tripod. The weather meters should come with a few to get you started. 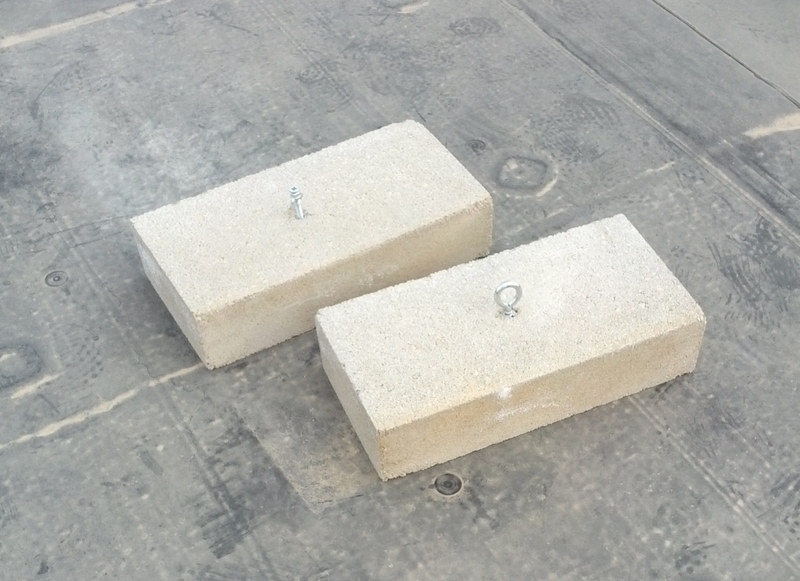 Eyebolts and concrete anchors - Ballast is useless if you can't attach to it securely. 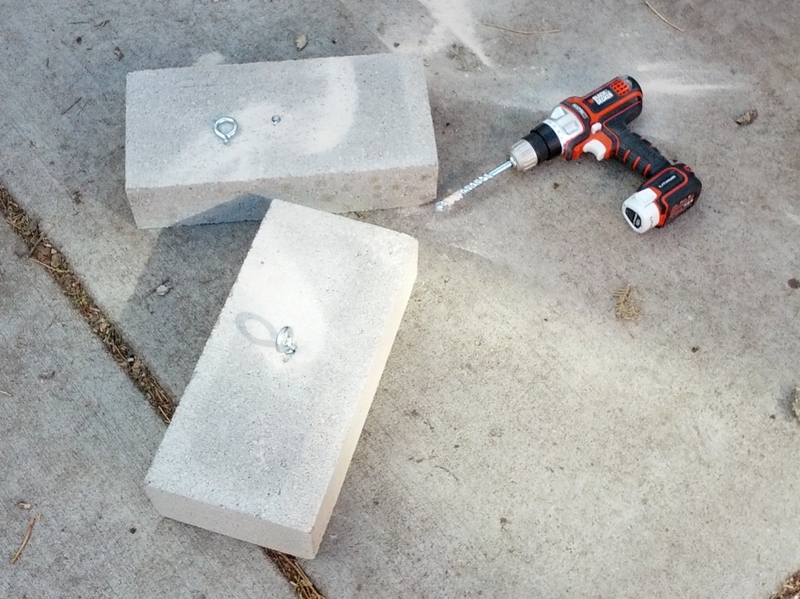 An eyebolt with a lead anchor makes a very secure connection to the cement block. Wire rope, cable clips, and turnbuckle - Wire rope with clips should survive extreme conditions. 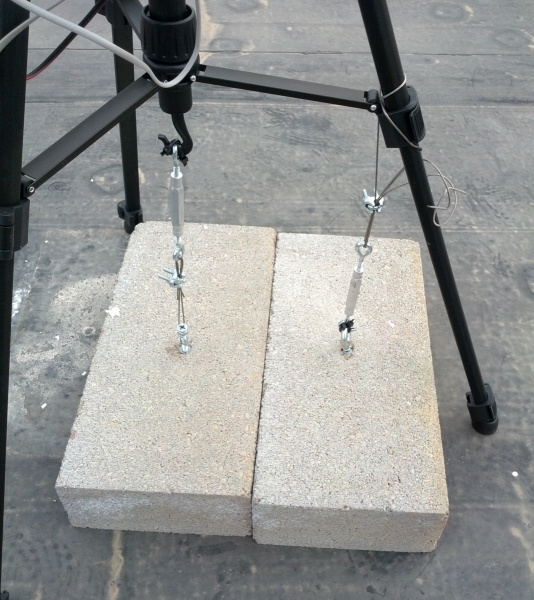 The turnbuckle was key; it allowed mass to be easily tensioned onto the tripod. Galvanized metal bits - To hold the solar panel in place. The system is designed to be low-power enough that a battery+charger+solar combination will suffice, but, if you have a source of power near your weather station, feel free to simplify things and use a wall adapter. This is our Arduino-compatible workhorse. It will gather all the weather data from the weather shield and then pipe serial strings to the Imp. You can read all about the Weather Shield over on its hookup guide tutorial. All you really need to know is that it's capable of reading a huge number of weather metrics but doesn't have the capabilities to wirelessly report them. Clear the card detect CD-A0 jumper so that the Arduino can take readings from the wind vane without being affected by the Electric Imp shield. The easiest way to clear this jumper is to carefully cut the connecting trace with an exacto knife. The Electric Imp is a simple to use internet-of-things device. It's like a Wifi adapter with a bunch of built in bells and whistles. We'll set it up to receive the serial strings from the RedBoard and pipe that data to an agent that will in turn post the weather metrics to Wunderground. Note: The Electric Imp shield shown above has been modified for wireless bootloading of the Arduino. This saves an immeasurable amount of work! We can reprogram the Arduino from the comfort of our living room rather than climbing up on a ladder and plugging in a USB cable. 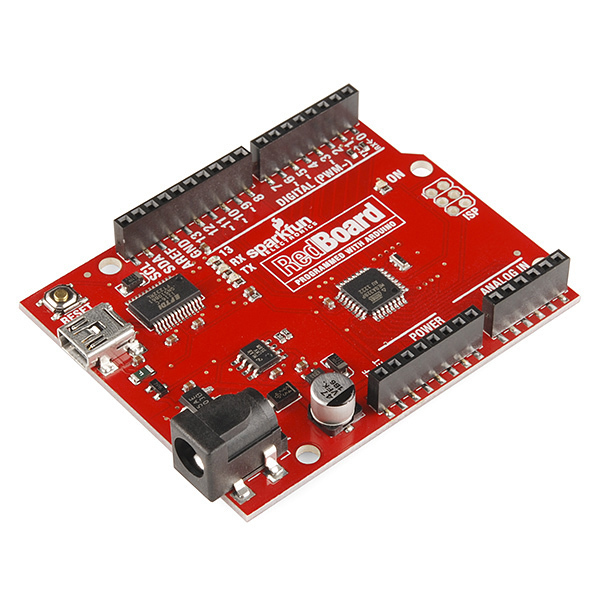 To find out more checkout our tutorial on Wireless Arduino Programming. The Wimp runs off a 3.7V 6000mAh LiPo battery. Weather station stackup with solar charger and 2000mAh battery. Final installation uses a 6000mAh battery. 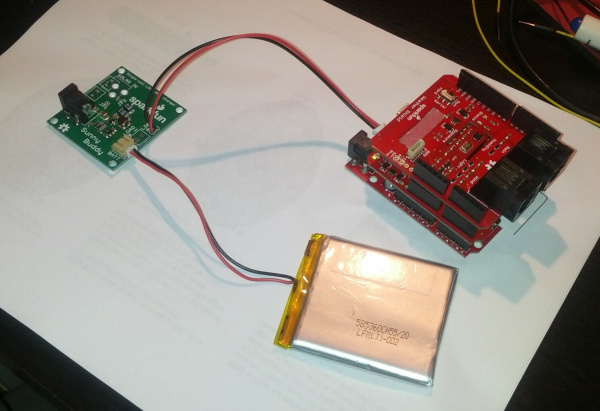 The voltage of the LiPo battery will vary from 4.2V when fully charged to 3.2V when very dead. 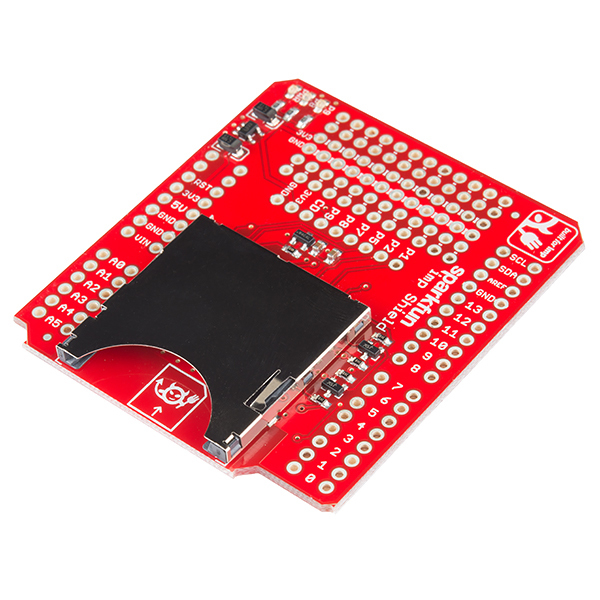 This is acceptable because the RedBoard can operate from 5V down to about 3V, and both the Electric Imp and the Weather Shield have on board 3.3V regulators. 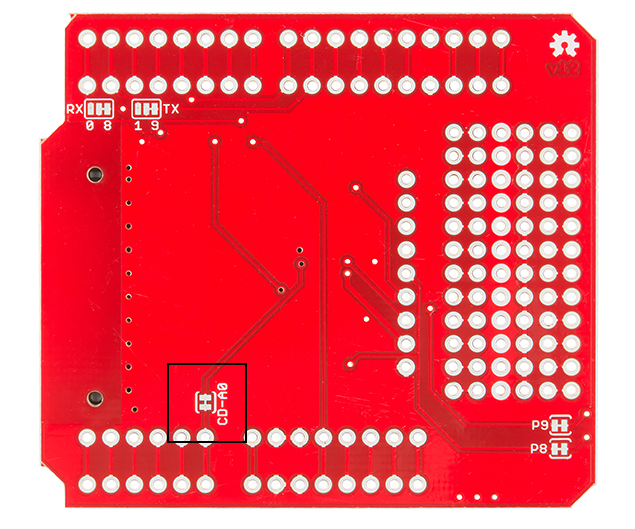 The RedBoard can also detect what the system voltage is at by doing an analog to digital conversion. Basically we connect the 3.3V rail of the Arduino to one of the analog pins so that we can establish what the battery level voltage actually is. You can read more about this trick over on the ML8511 UV tutorial. The average total current consumption of the system is about 39mA. This means on a 6000mAh battery the system will run for about 150 hours or about 6 days. This should be pretty good for Colorado, with 300 days of sunshine. If the solar cell does get covered in snow, the angle of the panel will help remove it. If all things go pear shaped and the system dies, you've probably got bigger (weather) problems to be worrying about. If anyone knows of a good article on how to size your battery capacity vs power requirements vs charging system, we would be thrilled to link to it! 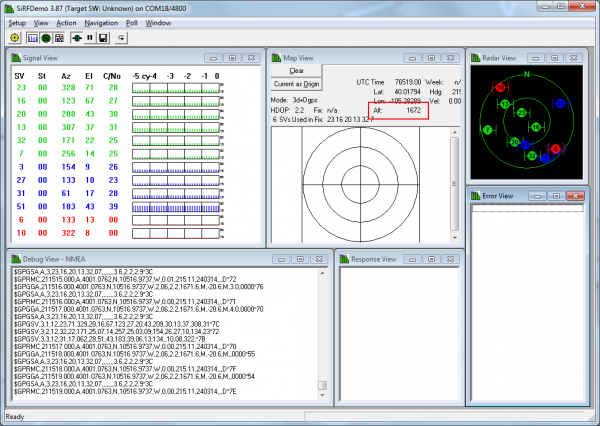 Creating a good weather station enclosure is difficult. There has been a fair number of comments on the Weather Shield product page and a great number of discussions and solutions proposed on the Internet. Our plastic red enclosure is very robust against adverse weather and is easily modified with tools found at home (hand drill, dremel, etc). 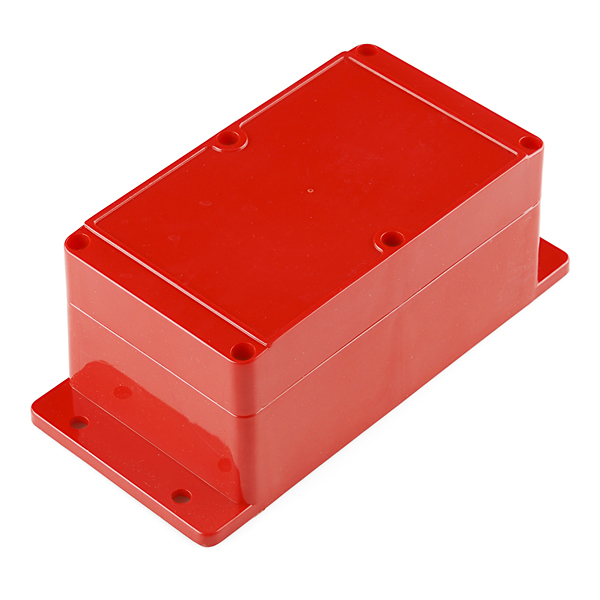 The problem is that depending on where you want to mount your weather station, the red box enclosure can heat up quite a bit. In Colorado direct sunlight can be quite intense, so do plenty of Googling to determine what's best for you. For this project, we went all out and used a radiation shield from Ambient Weather. A solar shield allows for free flow of air across the sensors while reflecting the majority of incident heat. Additionally, this enclosure had plenty of room for our stack-up of Arduino shields, batteries, and solar charger. There are three long threaded rods with three wing nuts that hold the stack of plastic layers together. Opening the enclosure takes a few minutes but is pain free. It is not obvious from the photo, but the three cables (wind, rain, and charging) enter into the enclosure through the gap between two of the layers about half way down the enclosure. Initially, because the solar shield is open to the elements, I was nervous that stray wind and rain would eventually cause the electronics to fail. My wife had the excellent idea of wrapping the non-sensor bits in cellophane. Two of the layers are wrapped, and the top shield (the weather shield) is left exposed so that the air can freely move across the sensors. It's not entirely clear if this method is preventing water damage to the stack of boards, but it puts my mind at ease. When repairs are needed, I'll update the tutorial with any future insights. At first, I thought I would need a light pipe to get light into the enclosure. After installing the station on my roof, I found that plenty of light is passed through the gaps of the radiation shielding to get a great ambient light reading. If you're looking for a more scientific reading, you might consider piping light directly. Someday, it would be fun to gather UV data as well. 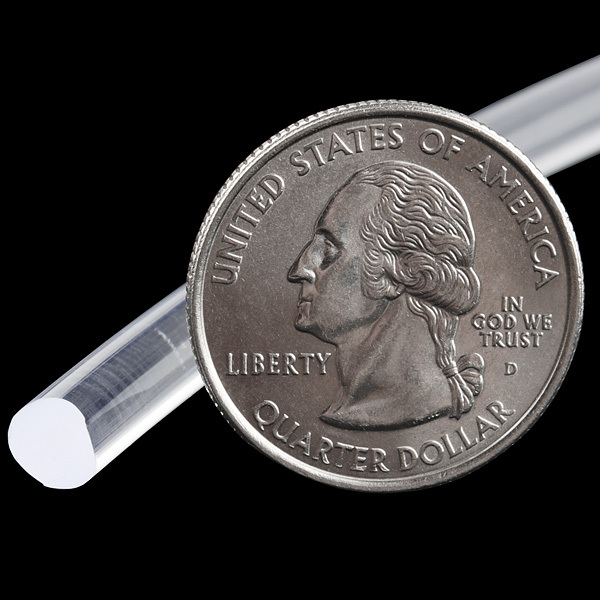 We've got a great ultraviolet light sensor, but the light pipe material may or may not pass UV light specifically. If you have any information or experience gathering UV readings, we welcome your feedback! First, solder the headers onto the shields, and build up the stack. Not sure how to solder the headers on? Checkout the tutorial on installing Arduino headers. This will also be a good time to solder the two RJ11 jacks to the weather shield as well. These will connect to the cables coming off the weather meters. 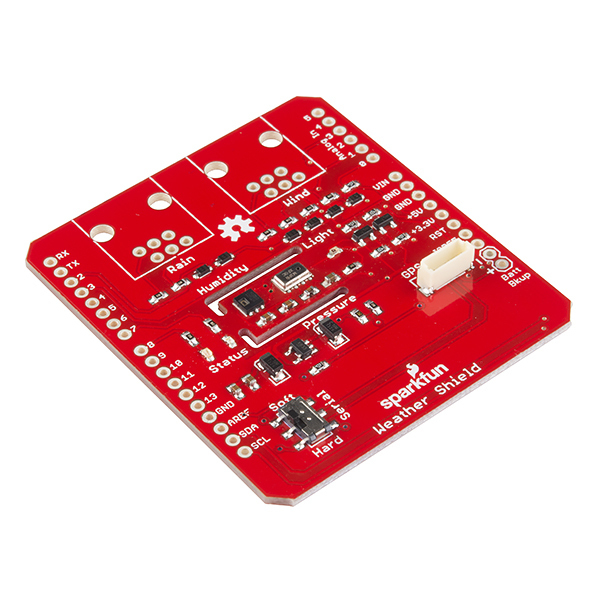 Once you are finished soldering, you're ready to program your weather station! This project required quite a bit of extra mechanical bits to withstand mother nature. The weather station was installed on an old camera tripod. A hacksaw quickly removed the head of the tripod where the camera attaches. The weather meters are attached using two hose clamps, and the solar shield is attached using the included U-bolts. To hold the solar panel at the proper angle, a steel hanger was used. Commonly used with sheetrock, the metal was heavy enough gauge to be bent with hand tools but rigid enough to hold the solar panel in place. Using construction adhesive and a clamp, we attached the solar panel to a piece of metal then zip tied the metal to the camera tripod base. Be sure to mount the solar cell where it can get a clear view of the sky, away from any possible shading. The incline angle of the solar panel was not scientifically determined - I pointed the solar panel to the south with about a 45 degree angle. This is a common orientation in Colorado, but there are plenty of solar angle calculators available to help you determine the best inclination for your part of the world. Because the winds are so strong in our area, I wanted to be sure to attach the base to as much ballast as possible. I found solid cinder blocks weighing 35lbs each (16 kilograms) along with eye-bolts and lead inserts at my local hardware store. Using a 1/2" mason bit, I drilled a hole for the lead inserts then used a cheater bar to twist the eye bolts into the cinder block. Notice that I rotated one eye bolt completely off its screw; I should have probably used slightly larger inserts to allow for that size eye bolt. I used a regular bolt with a few wing nuts on the second block. Once installed the eye bolt and screw were very solidly attached to the cinder block. 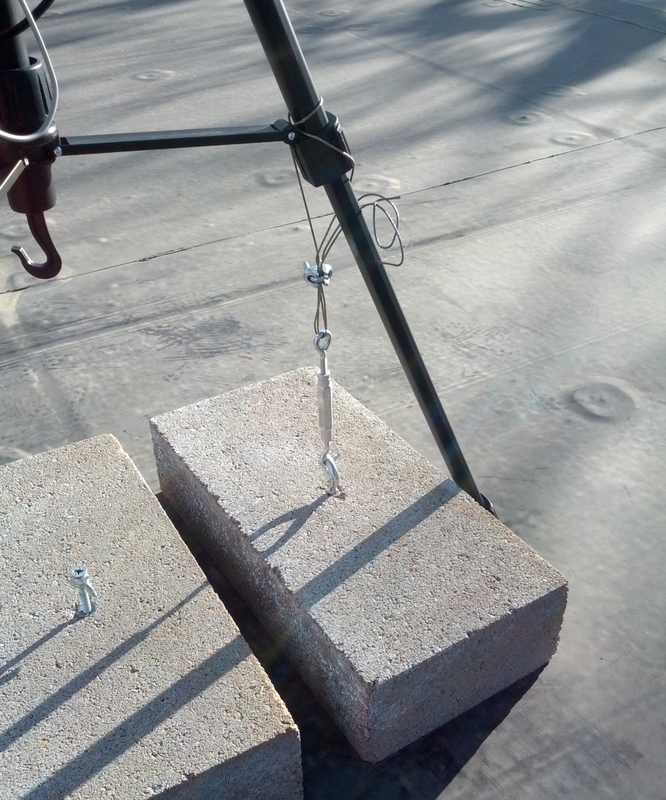 Shown above is the final setup using wire rope with wire rope clips and turnbuckles. Zip ties prevent the turnbuckles from escaping from the eye bolts. This provided a really solid connection from the ballast to the tripod. The turnbuckles are tensioned so that they were one twist away from raising the concrete block a smidge off the surface of the roof. Boulder is known for strong gusts of wind that can break 100MPH (160KPH) a few times a year. 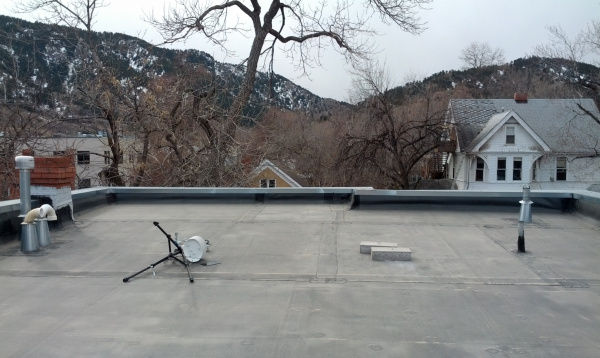 Finding a location on my roof where I could solidly attach the system was crucial. I didn't watch to drill into my roof or the sides of the house, so instead I decided to use a tripod with ballast to hold the station in place. This first setup used zip ties to tension the two blocks to the base of the tripod. Unfortunately I had some really bad zip ties. You know - the ones that snap or release as soon as you put a bit of force behind them? I know this attachment system was questionable, but note the snow and my decision to start this project in December. After a bit of Googling, I discovered these things called turnbuckles! Wow they work. You probably fall into one of two categories. Either you know exactly what wire rope is, and you think I'm crazy, or you're like me, never anchored something before, and think zip ties'll do it. Believe me - they won't. Setup number 3 - now with wire rope! The third setup adds a proper turnbuckle and wire rope. This setup is really nice and solid! The turnbuckle makes it really easy to tension the full 35lbs onto the tripod. Who needs the second ballast? There are roughly a dozen nights a year in Boulder, CO where you question the build quality of your home. The windows vibrate, the walls shake, and you lay awake at night thinking about the large trees out front coming down on your car. On February 20th, 2014, the station blew over. A cup broke off the anemometer, the wind direction vane broke off completely, and the solar cell broke off its mount. The damage was rough, but I'm lucky the station didn't leave the roof entirely. Late on February 20th, the station clocked a few 50mph gusts before the ballast was moved 6 inches and the turnbuckle came unhooked from the eye bolt. The station blew over, the Imp SD card popped out of the socket on the shield, and Wimp stopped reporting. Because one ballast was attached and one was not, we get a neat view into how much the station actually dragged 35lbs across the roof. I believe the station would have not been blown over if the turnbuckle had not worked itself out of the eye bolt. Remember the previous picture? I never zip tied the hook to hold it against the eye bolt. Here's what the setup looks like today. I don't recommend using zip ties for loads any more, but they do a great job of making sure the hooks won't escape the eye bolts. Above all else, put the Wimp where it can be easily maintained. Things will break - be sure you can access your weather station with as little danger as possible. You may think you'll only have to do maintenance on the weather station once a year. If you're building your own, plan to be in the station once a week in the beginning and once a month after you get it up and running. No matter how much you try to prevent it, there will be problems with your code. Even Spirit, the Mars rover, had a rolling reboot issue. I had similar problems with small errors including a bug that arbitrarily zeroed the wind gust measurement. When I started this project, I assumed the Arduino portion of the project would have to be locked in because who wants to climb on their roof to plug in a USB cable to reprogram the Arduino? Luckily, a few weeks after the first station was built I discovered the Imp could wirelessly reprogram the Arduino. This has proven to be extremely helpful. If you can, plan for bad code, and make your device remotely reprogrammable. 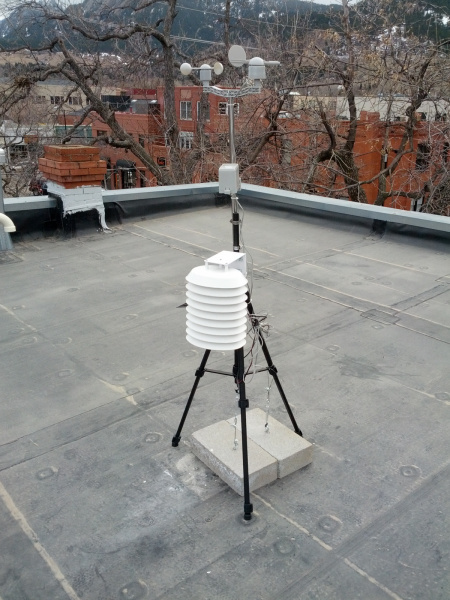 By building your own weather station, not only are you learning a ton about DIY electronics, but you also get a good taste of what it takes to deploy an electronics project in the real world. And congratulations - you've added something to this thing everyone keeps calling the Internet of things. It's a good thing! More weather data means better forecasting in the future. This was a big tutorial to write! We hope you've enjoyed it. If you've got similar weather projects or lessons, please let us know.